Earning an online master's degree in theology is one way individuals can enhance their understandings of religious beliefs and theories and learn how to apply them in applicable careers such as pastors, ministers, directors of religious education and religion teachers. Students wishing to pursue a master's degree in theology while also maintaining full- or part-time work may find that online programs are a good fit for them. Find more information on potential programs, timelines and possible career paths for master's degree in theology graduates below. 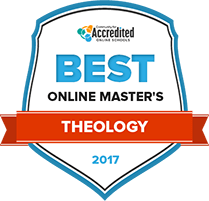 One way to begin the search for an online theology master’s degree is to compare some of the top-rated programs. The list below ranks programs based on a variety of important factors, such as tuition and fees, academic services offered and graduation and job placement rates. Established in 1859, the Southern Baptist Theological Seminary is one of the oldest and largest seminary institutions in the Southern Baptist Convention. Master’s degrees are available in several different areas, including theology. The Master of Theology (ThM) degree offers a research or ministry track, both with the same core course requirements. The ministry track is designed for ministry preparation while the research track is geared towards students planning to move on to a PhD degree, and contains more concentrated areas of study along with a research and thesis component. Also available to qualifying master’s degree students is a modular ThM in Theological Studies degree. Columbia International University’s MA in Theological Studies degree, which is available fully online, prepares graduates for missionary, ministry and marketplace work, teaching and scholarly research and writing projects. This master’s degree is available to both students with a background in theology, and for those coming in with unrelated undergraduate degrees. Program one is for students with no previous theology experience and has additional courses in bible and theology, with a program total of 48 credits, and program two is for those with at least 30 semester hours of bible, theology or church history credits, with a program total of 33 credits. The master of arts in biblical exposition at Moody Bible Institute prepares students to serve their communities through preaching the Scripture. Graduates will be prepared to establish ministries, create sermons and communicate effectively. They may go on to professional positions or serve in a lay capacity. The program is unique because it delivers coursework at the master's level that is generally associated with doctorate-level theology. The program, which operates on a cohort-based framework, begins a new session three times a year. Upon graduation, students will be able to develop their own preaching philosophy based on the needs and makeup of their communities. The master of arts in Bible and theology degree gives graduates the tools needed to help others develop a Scriptural understanding. The program, which is delivered completely online, consists of courses that follow a seven-week format. Students take two courses back to back each term. Terms take place in the fall, spring and summer, and there is one-week break after classes end before they begin again. This enables students to finish the entire program in two years while focusing on just a single course at any given time. The program follows the cohort format, with new cohorts starting every spring and fall. Master of arts degrees are available at Cornerstone University in both ministry leadership and biblical study. Both graduate degrees are available completely online. The ministry leadership degree, which can be finished in two years, is designed for students who either work full time in the ministry or who intend to do so. Students receive advanced ministry training and instruction in both biblical studies and theology. The biblical studies MA is taught by published scholars who have lived and studied in Israel, and who are counted as experts in both testaments of the Bible. The Harvard Divinity School offers three degrees at the graduate level: master of divinity, master of theology and master of theological studies, which can be finished in three, one and two years, respectively. Divinity School programs have a higher percentage of international components than any other school at Harvard. The school hosts many renowned events and services, including the Religious Literacy in the Professions Initiative. The school maintains a database of article posts and tutorials showcasing the lives and careers of both former and current students and faculty, as well as resources describing the programs and their potential outcomes. Dallas Baptist University is a liberal arts university with a large variety of undergraduate and graduate degrees, including those based on Christian faith. For students planning to study theology at the graduate level, a MA degree is offered in theological studies, with concentrations available in Christian scriptures, heritage and ministry. Also offered is a dual degree in theological studies and worship studies, and several accelerated bachelor’s to master’s degrees, including a BA in biblical study/MA in theological studies. The MA in theological studies degree is offered online or as a hybrid program with evening classes available to provide flexibility to those with outside obligations. Both the Department of Christian Ministries and the Department of Theology offer master's degrees for graduate students at Lee University. The former prepares students for entry-level work in the ministry, and the latter gives students the option of a pastoral studies emphasis or a pre-graduate studies emphasis. Graduates will be prepared to enter highly regarded universities and seminaries, to teach at the college level, serve in para-church ministries, serve as pastors in churches or embark on missions across the world. Advisors will work closely with students to ensure they meet all the requirements for graduation and choose the appropriate courses. The Davidson School of the Jewish Theological Seminary of America offers a master's degree in Jewish education. The program is designed for students who plan to serve as leaders in Jewish education. Master of arts candidates will receive immersive instruction in both Hebrew and Jewish education. Students can choose from two different tracks, but no matter which area of focus they choose, they will be able to supplement their education with instruction in educational technology or arts education. Students can also choose to pursue the exact same degree and coursework 100 percent online. There are several theological degrees available at the graduate level, including master of arts degrees in church ministries biblical studies, biblical counseling, intercultural studies, and a master of divinity degree. The church ministry MA is a 36-hour professional degree. The biblical counseling and intercultural studies MAs are both 60-hour programs. The biblical studies degree is a 72-hour program and the master of divinity degree is a full 96 hours. All programs are run through the Baptist Bible Theological Seminary, which exists to train Christian students for life callings as pastors, missionaries, lay leaders, counselors and church staff. Prospective students may also need to consider their individual needs and goals in addition to factors that attribute to the rankings listed above. These individual needs often include elements like school size and population, geographic location and denomination. The search tool below is designed to help students locate a well-suited theology master's degree program. The time it takes to earn an online master's degree in theology depends on several factors like whether an individual studies full-time or part-time or if he or she will need to take time off to attend to employment requirements or family obligations. The timeframe to complete a master's degree may also be dependent on the requirements of a specific school or program. Many programs, however, are designed to be completed in two years, given the applicant attends full-time. The sample timeline below offers a look at what a student may expect to encounter in a typical two-year degree program from application to graduation. The application processes for most online master’s degree in theology programs are similar. However, some admissions requirements can vary from program to program due to the unique and personal nature of the major subject. Below is a list of some important elements to consider when applying to an online theology master’s program. Earning a bachelor’s degree from an accredited college or university is typically required for admission into a theology master’s program. Most schools express a preference for a theology undergraduate degree, but may admit students with a bachelor’s degree in another major as long as that student has completed a specified number of undergraduate courses in theology or philosophy and expresses a sincere interest in the study of theology. Student undergraduate grade point averages are normally considered by master’s admissions committees. However, minimum GPA scores vary significantly from program to program, with many schools making exceptions for students with lower GPAs if they can demonstrate a reason for the exception, such as taking honors courses. The GRE is often a staple requirement for most master’s degrees, but this may not be necessary for a master’s in theology program. Be sure to check the admissions requirements carefully for all theology programs under consideration. If required, a student may need to make accommodations to prepare for and take his or her GRE in time to receive the results to meet application deadlines. Submission of one or more letters of recommendation is a common application requirement. In the case of a master’s in theology degree program, some schools place restrictions on who may write a letter. For example, some programs mandate that a letter of recommendation be written by an undergraduate theology professor or clergy member. Be sure to review a specific application’s " for all programs under consideration. Most programs will require an applicant to submit a written personal statement describing his or her purposes and goals for earning a master’s degree in theology. This personal statement may be referred to by various terms such as "statement of purpose," "statement of intent," "statement of calling" or "religious autobiography." A declaration of religious affiliation may be, but is rarely, required. Most master’s in theology programs welcome students of all denominations. Depending on the specific program, earning a master’s in theology may or may not require the completion of a thesis. Whether a thesis is mandated or not, first-year students will typically focus primarily on a schedule of core courses. Theology master’s programs generally require students to successfully complete a set of core classes, regardless of their chosen area of specialization. Subject matter for these classes varies substantially depending on a specific program’s goals and denomination, but in most cases, the focus is on interdisciplinary study that introduces the student to basic terminology, research skills, and principles and issues of theology, laying a foundation for the more advanced coursework to come. In almost all cases, online theology master’s students will be required to pick a topic of specialized study, which will often entail the completion of an additional set of courses on that topic. Choosing a specialization or concentration is commonly done early in the student’s first year of study. Online master’s degree programs in theology often require completion of a thesis, capstone project or master’s essay. While these projects are usually completed and presented in the second year of study, it is common for students in their first year to attend counseling, a seminar or classes to research and select a thesis, capstone project or master’s essay topic. Students in their second year of study will often find themselves busy with more coursework as well as completing their thesis, other culmination project, internships and final exams. Students will typically shift their focus from core classes to required courses in their area of specialization. Additionally, some programs allow students to complete a number of elective courses. Some schools offer internships and/or field experience projects, either as a degree requirement or as an option. Internship and field experience options depend heavily on a program’s religious affiliation and community interaction policies. Additionally, work associated with a student’s internship or field experience may or may not be applicable to his or her thesis, capstone project or master’s essay. A surprising number of theology master’s programs often feature a foreign language component. Students usually will either need to demonstrate a proficiency in a foreign language, like German, French or Spanish, or complete coursework to achieve proficiency in order to graduate. A particular language may be specified in the requirements for a particular school, degree program or specialization. Graduation requirements often vary from program to program, but several factors are usually found in many online theology master’s programs. Students are advised to familiarize themselves with all degree components of their particular program at the beginning of their academic careers to ensure compliance with a specific program’s requirements. Most programs require students to maintain and complete their coursework with a stated minimum cumulative grade point average. That minimum score differs by program, but normally falls between of 2.5 to 3.5 on a 4.0 scale. A typical minimum GPA is 3.0, but may be higher for those students continuing on to a PhD program. Depending on the specific program, passing one or a number of comprehensive examinations may or may not be a required. Comprehensive exams are more commonly a feature of non-thesis track programs and are almost always mandated for programs without any form of culmination project component. Students will need to finish and then submit their completed thesis or other culmination project to the appropriate faculty committee, who will in turn review the student’s work and either accept or reject it. Submission of one’s thesis may or may not be followed by an in-person defense of the work before the faculty committee. A few online programs feature a campus residency component to their theology master’s programs. This residency requirement is typically short in duration and may take one of several forms, such as a summer residence or a specified number of days within the semester or term. Prerequisite coursework may be necessary. Online master's in theology graduates may find a limited number of job titles available to them, but those jobs are spread throughout a variety of religious groups and denominations as well as in private schools and college campuses, both religiously affiliated and secular. Employment prospects and salary potential may vary depending on the particular job title and denomination. Clergy, also referred to with titles like pastors, ministers or priests, typically conduct religious worship in churches, mosques, temples and other locations. Additionally, they often perform other spiritual functions and rituals associated with their particular religious faith. Clergy often attend to the spiritual and moral needs of their congregation, providing guidance and counseling. Religious activities and education directors typically coordinate and direct programs for congregation groups and individual members. In addition, they often provide guidance and counseling to congregation members on faith, spiritual topics and related issues concerning marriage, family, health and finances. Philosophy and religion teachers on the postsecondary level generally teach courses in philosophy, religion and theology on college, university and seminary campuses, both public and private. They often conduct research projects in combination with their teaching duties. Upon graduation, online theology students should typically possess a solid understanding of the multi-denominational field in general and an advanced knowledge in a specific discipline. In other words, students should graduate with a strong foundation in the theories, terms, methods and paradigms within one or more theological disciplines. Graduates should generally be able to articulate, both verbally and in writing, basic theological history, concepts, methodology, factual information, statistics and data. Students should typically possess the critical thinking and communication skills necessary to apply theological knowledge into several appropriate forms, such as class lessons, sermons, academic articles and dialogues. Online master's in theology graduates often possess solid skills in both research and analysis. Specifically, students should be able to formulate questions and hypotheses, conduct academically sound investigations and research, and present findings in a form that can be properly reviewed and successfully defended. Graduates should generally be able to effectively apply theological knowledge and skills into a variety of real world situations and tasks as spiritual counselors, educators and advocates for social change. Graduates often possess the ability to address problems and issues to both religious groups and the community at large. The AAR is a professional association of approximately 9,000 teachers and scholars working at colleges, universities, seminaries and other schools throughout the U.S. and abroad. Its website offers access to information on conferences, meetings, publications, programs and other membership services. Representing over 100 theological schools in the U.S. and Canada, the ATFE was founded to cultivate the education of the theological field. Its website offers access to research and publications, conferences and meetings, and other recourses for theological field educators and others. The ATS is a professional organization representing more than 270 graduate schools in theology in the U.S. and Canada. Its Commission on Accrediting accredits postsecondary institutions and the programs they offer. It provides additional support, including research and programs, for its faulty and administrator members. The ETS professional association consists of biblical teachers, scholars, pastors, students and others involved in evangelical scholarship. It sponsors a number of resources including the Journal of the Evangelical Theological Society. Founded in 1994, the Society for Hindu-Christian Studies is dedicated to the study of Hinduism and Christianity and the interrelationships between the two religions. It sponsors annual meetings and publishes the Journal of Hindu-Christian Studies, which features peer-reviewed articles, book reviews and other items related to the Hindu-Christian field.